In 1683-1685 John Graham of Claverhouse was given a commission to rout out Covenanters in the south-west of Scotland. 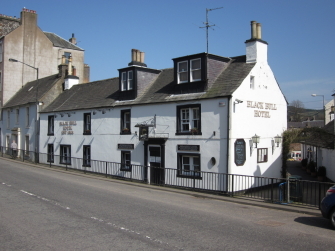 For a period of time, he made the Black Bull Inn in Moffat his headquarters. A plaque on the wall of the inn facing Church Gate commemorates this. My Lord, I came here [the Black Bull Inn in Moffat] last night with the troop and am just going to march for Dumfries, where I resolve to quarter the whole troop....I am informed since I came that this county has been very loose. On Tuesday was eight days, and Sunday, there were great field conventicles just by here, with great contempt of the regular clergy; who complain extremely that I have no orders to aprehend anybody for past demeanours. And besides that, all the particular orders I have being contained in that order of quartering, every place where we quarter we must see them, which makes them fear the less. I am informed that the most convenient posts for quartering the dragoons will be Moffat, Lochmaben and Annan; whereby the whole county will be kept in awe. Besides that, my lord, they tell me that the end of the bridge of Dumfries is in Galloway, and that they may hold conventicles at our nose, we dare not dissipate them, seeing our orders confine us to Dumfries and Annandale. Such an insult as that would not please me; and, on the other hand, I am unwilling to exceed orders, so that I expect from your lordship orders how to carry in such cases.